Senior care in Tampa doesn’t end at home. Making sure your elderly loved one is safe on the road is also important. 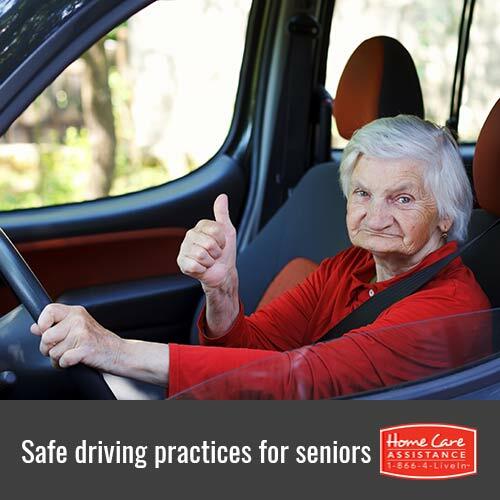 Even though many seniors are good drivers, there are still driving practices they can follow to ensure greater safety. Following good habits can make the driving experience for the elderly safer and more enjoyable. Some elderly drivers may want to avoid taking the highway because of the faster traffic around them. Taking other routes to and from their destination may be safer. However, if staying off the highway is not an option, your loved one needs to merge with the flow of traffic and avoid going too slow. Seniors should always enter the slow lane until they match the flow of traffic. It can be dangerous for an elderly driver to follow too closely behind another car. Instead, your loved one should make sure there is at least a three-second cushion when driving behind another vehicle. In instances when the weather is foggy or the roads are slippery, at least a six-second cushion is recommended. This can help your loved one stop in time if the car ahead of him or her suddenly brakes. Even though many people forget to use their turn signals, seniors need to avoid this bad habit. Many car accidents are caused when making a left-hand turn. Your loved one should check for traffic and pedestrians in every direction before making a left turn and always use a turn signal. Before turning, he or she should wait for oncoming cars to pass before proceeding. When seniors are behind the wheel, they should concentrate on driving only. This means no maps, cell phones, eating, or any other form of multitasking. Remaining focused on driving can help your loved one prevent accidents and gives him or her enough time to react to any issues on the road. Putting the car in reverse is difficult for some elderly drivers, especially in crowded parking lots. Therefore, your loved one should not rely solely on a mirror for help when backing up. Instead, he or she should look over the shoulders and double check the mirrors before backing up at a slow pace. Driving can equal freedom for many seniors, but it must be done in a safe manner. If your loved one is facing age-related challenges that affect driving, but still wants to maintain independence, a Tampa part-time caregiver can help. The caregivers at Home Care Assistance can provide transportation to and from medical appointments and take your loved one on errands such as grocery shopping and prescription pick-ups. With Home Care Assistance, your loved one’s safety is always the #1 priority. To learn more about our senior care services, call one of our qualified Care Managers at (727) 330-7862.